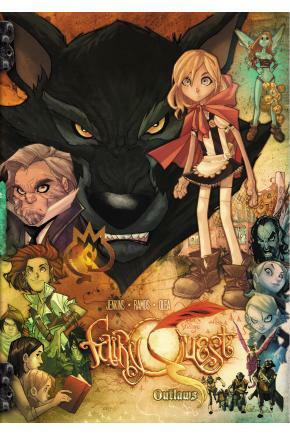 The Fellowship was fortunate enough to obtain a copy of FAIRY QUEST #1 from Boom! Studios. Paul Jenkins writes, and Humberto Ramos draws. Things are happening in Fablewood. Some of the fairy tale characters are starting to get bored with the routine, and Mr. Grimm and his Think Police are very strict about routine. So when Little Red Riding Hood takes off with the Big Bad Wolf, the place is in an uproar. The only safe place is with an old friend out on the outskirts, and how safe that is remains to be seen. How can you go wrong with a bad guy group called the “Think Police”? That alone hooked me into the story. But then came the idea that the characters might just be actors in their stories, and how dynamic that could turn out to be. No one is exactly what you expect, and there’s a lot of potential in that. And Ramos adds his beautiful art to give us a sense of reality under the fantasy. Fairy tales and their variations are getting popular right now, and this is a fun take on it. I find myself regretting that this is only a two-part run; I’d like to see more. FAIRY QUEST #1 is available now at your FLCS or by order from boom-studios.com.